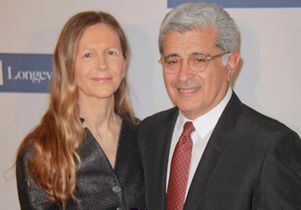 A gift from philanthropists Jane and Terry Semel will enable UCLA to expand research, teaching and activities connected to the campus’s Healthy Campus Initiative. Chancellor Gene Block announced the gift May 9 at the initiative’s annual celebration at Pauley Pavilion. The funds will establish the Semel HCI Center at UCLA and support students, projects and programming. The initiative, which was instituted at UCLA in 2012 and officially launched a year later, was envisioned by the Semels and funded by them with support from Block and other senior administrators and faculty. It aims to promote the physical, mental and social well-being of UCLA students, staff and faculty members and develop best practices that other campuses and communities can replicate. To date, the initiative has funded the creation of a traditional medicinal garden at the Ronald Reagan UCLA Medical Center, the biodynamic jane b semel HCI Community Garden at the UCLA Sunset Canyon Recreation Center and hundreds of health-related student projects. The initiative also supports up to 10 graduate student researchers each year and has driven the development of several new UCLA courses, including a popular life skills class, and an undergraduate minor and graduate-level certificate in food studies. It also played key roles in enhancing UCLA’s student dining offerings, which are widely regarded among the nation’s most healthful; developing and studying a teaching kitchen curriculum for undergraduates and health sciences students; implementing UCLA’s smoke-free campus program; and developing one of the nation’s first campuswide diabetes prevention programs. “The Healthy Campus Initiative has spread across the campus, creating a kind and compassionate community, and is setting an example for others to follow,” Jane Semel said. UCLA’s program has galvanized similar efforts across the University of California — the UC Global Food Initiative and UC Healthy Campus Network have both developed a presence on all 10 campuses. In addition, HCI inspired the Partnership for a Healthier America to launch its own Healthier Campus Initiative in 2014, and that effort now boasts more than 50 college and university partner campuses across 29 states. The Semels’ latest gift continues the couple’s 25-year-plus relationship with UCLA. They received the UCLA Medal, the campus’s highest honor, in 2005, and their multifaceted philanthropy touches areas across UCLA and the Health Sciences, notably the Jane and Terry Semel Institute for Neuroscience and Human Behavior at UCLA.